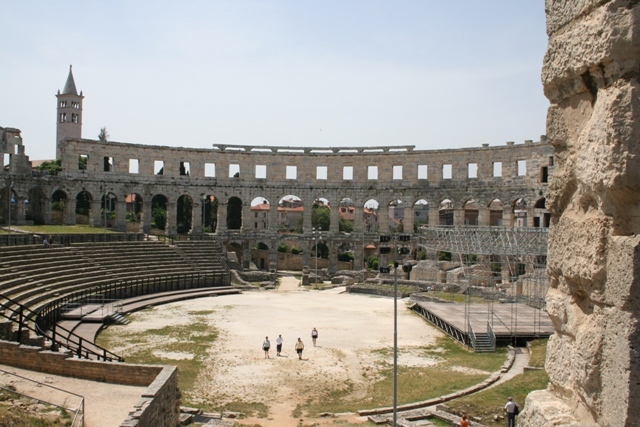 I had read so much about the Roman amphitheatre in Pula that a visit was a must. So we had another day trip from Rovinj – just 45 minutes drive, easy and well signposted. 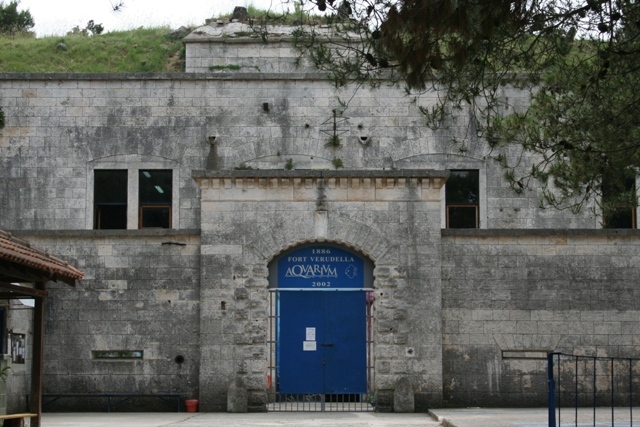 Pula is the largest city in Istria, aside from the tourist business it is an important ship building centre. For us though it was all about the amphitheatre. We found it easily, towering above a row of nondescript street buildings. It is immense and remarkable. It stands 3 storeys tall, is the 6th largest in the world and was built in the 1st century AD – about the same time as its more famous Roman sister. I have to say, it really does give the Colosseum a run for its money. You get great views from the outside, but it is definitely worth paying the entrance fee for a look inside. There were lots of tour groups but it didn’t feel at all crowded. They still have concerts here and the Pula Opera Festival takes place every summer. Lots of well known artists have performed in the amphitheatre, Pavarotti played his farewell concert here. It must be something special listening to your favourite performer in this stunning setting. We wandered, sat on the stone stairs and easily imagined gladiators fighting to the death. The old town of Pula is surprisingly beautiful. We spent ages wandering around the paved streets. Some impressive things to see here too – not least the Triumphal Arch of Sergius which has been standing since 27 BC. I also loved the Roman Forum and the remains of the Temple of Augustus built in the 1st century AD. 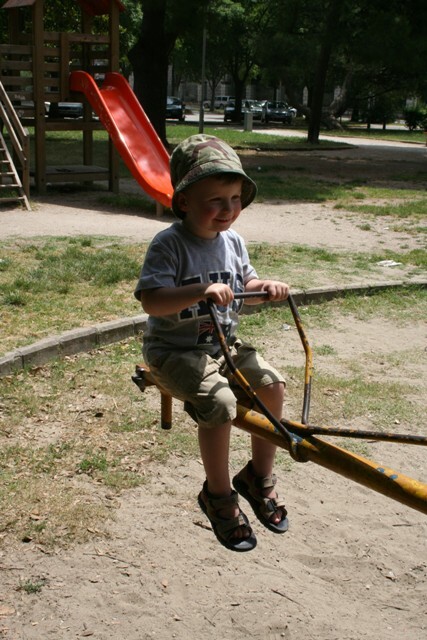 Son was very well behaved with all this sightseeing, in between Roman ruins we found a park where he let off steam. Just the right balance of culture and fun to keep things on an even keel. 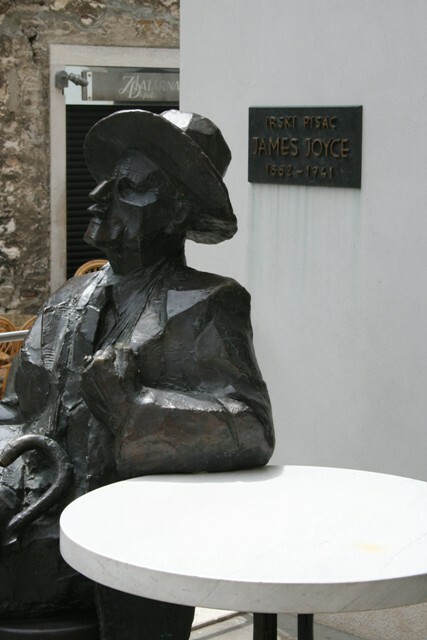 James Joyce lived in Pula in 1904 for 5 months where he taught English at the Berlitz language school, we found his house and a statue of the great man. Culture done, we spent the afternoon just outside the centre in Verundella. This is a gorgeous spot – a marina, lots of yachts, pine forests and to Son’s delight (another) aquarium. 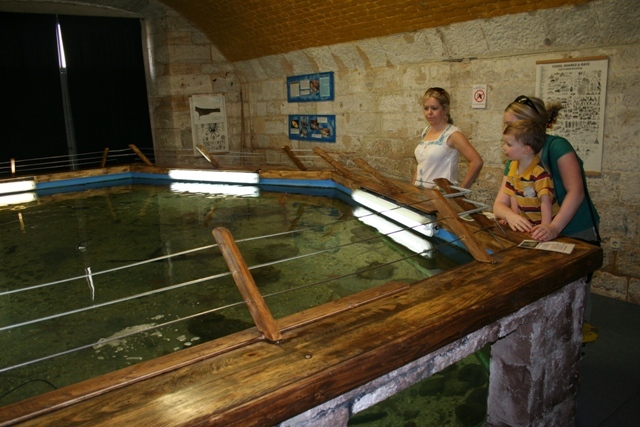 Much better than the previous aquarium adventure in Porec, this one impressed all members of the family. It is at the bottom of a 120 year old Austrian Hungarian fortress and takes up 5 big rooms. It is not flashy or modern, but it is quaint and quirky. 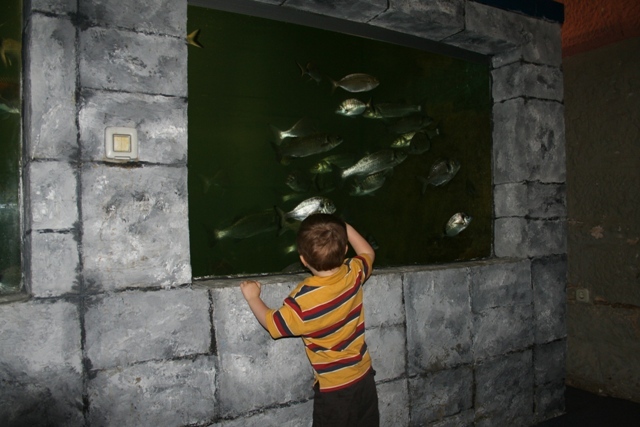 Son loved the big seawater tanks with dogfish, sea urchins, crabs and starfish. I loved the fortress – dark, gloomy and cold with thick impenetrable walls it oozed atmosphere. We wandered, explored and eventually found a long, dark tunnel which seemed to lead further underground. A surprise at the end, we found a gorgeous little outdoor cafe with the best ice-cream. Plenty of light at the end of this tunnel. 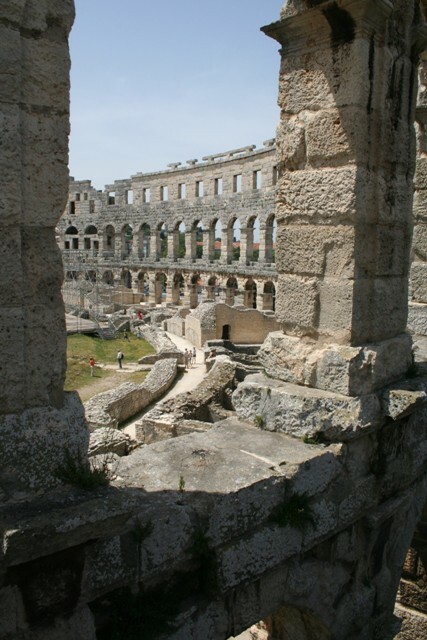 Thanks Anna – we love Roman ruins too, there’s just something about them isn’t there! Great thing for him to develop an interest in too. 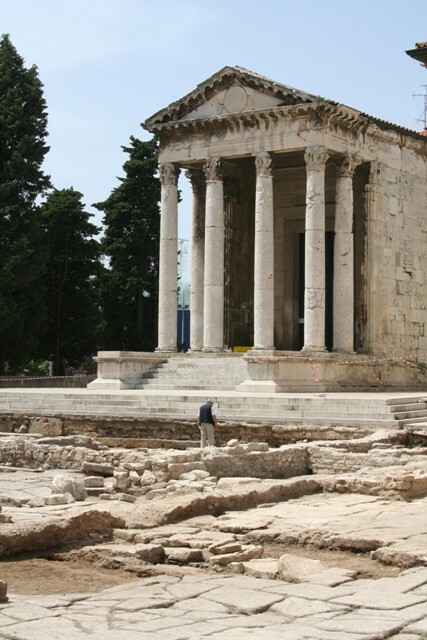 They are amazing – it is definitely worth seeking out other off the beaten track Roman ruins, they are less busy and you get such an incredible sense of the history without all the crowds. Have fun planning your Europe visit – look forward to reading about it! Roman ruins, one of the best things about visiting the UK and Europe. Great photos. Ice cream always does it for this family!! Son did well – you managed the perfect balancing act! The amphitheatre does indeed look like a wonderful setting for a performance – I guess those Romans knew what they were doing 😉 . Yes you gotta hand it to the Romans! Enjoyed this, Joy 🙂 (oops- sounds strange!) 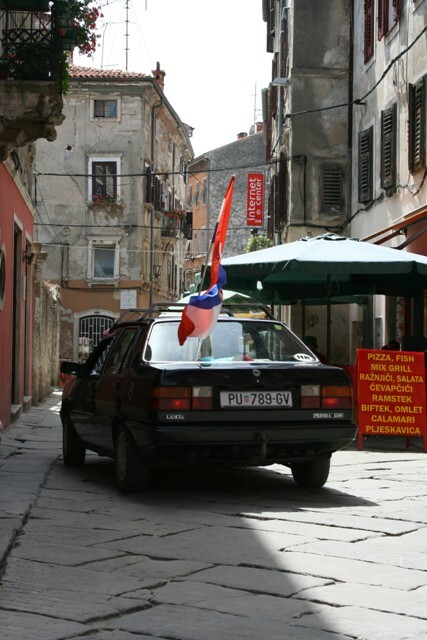 Pula is another place I’d thought about staying but I expect a day trip would be enough. Yes Jo, Pula is lovely but a day trip lets you see everything comfortably. To end the day with ice cream is to end it perfectly. (; gorgeous photos. Thanks. I’m feeling remiss now for thinking that Dubrovnik was the only place to go to see Rome’s glory in modern-day Croatia. Thanks for liking my post! 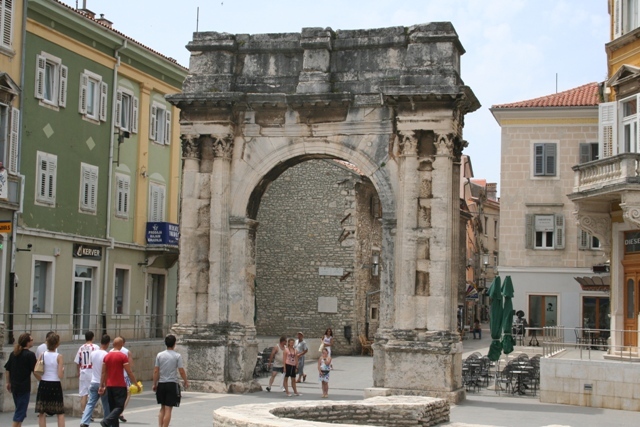 Loved reading this- I will be visiting Pula in just a few days! Hope you like it as much as we did, it is a fascinating place! 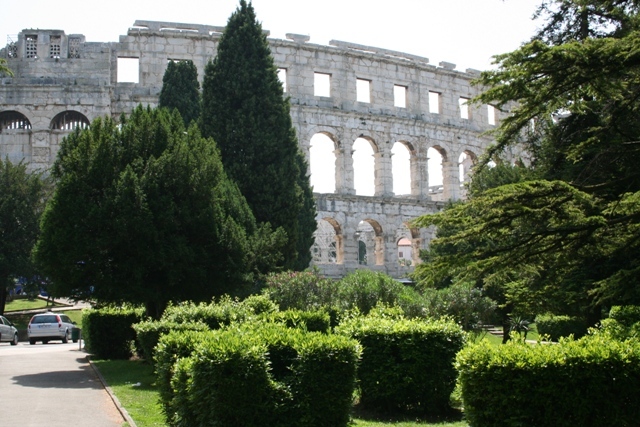 I’ve been to Pula once and it was amazing! Loved the city and all the different markets! We stayed on a camping side which was brilliant as well cause we had the sea right next to us. Such a lovely city – we were so impressed. Must have been nice to camp listening to the waves!! The amphitheatre was so impressive too, I loved all the history and would definitely go back there.